Last year was weird and crazy for us. I can’t say that it was all good or all bad but whatever it was, it was interesting all the way. There were many bumps in the road but we got through them. 1. MONSTER HUNTER 4 ULTIMATE!!!!!!! 1. Jupiter Ascending – Mila Kunis stars in this movie. 2. Fifty Shades of Gray… haha Not! Just kidding. This looks like tripe. 3. What We Do In The Shadows – Mockumentary about vampires by the Flight of the Concords people. 4. Chappie – This is by the director of District 9. If that wasn’t enough, Die Antwood act in the movie. 5. Mad Max: Fury Road – Watch the trailer, it’s what sold me on the idea of this movie. Books: Well… these came out last year or before but I am just reading them now. 2. Doctor Sleep – Seriously… the sequel to “The Shinning.” This is a must read. We are also seriously still into Legos in my house. We have a bunch of new sets to build and some older ones we just purchased. We’re planning to go to Brick Con and if we can get to California, Lego Land. 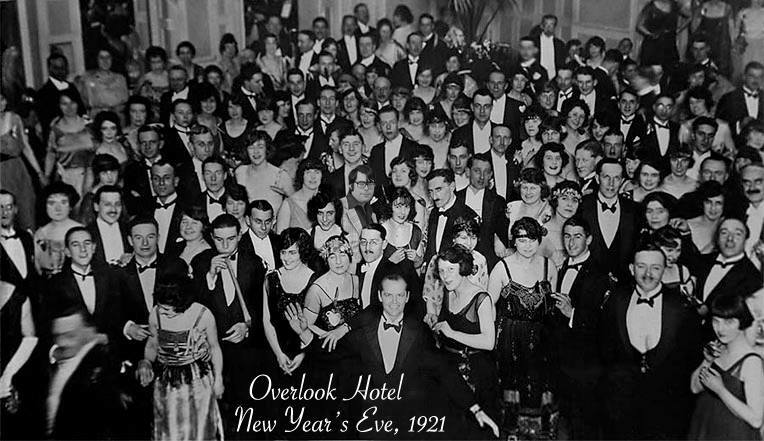 Here’s to a wonderful year to come. Kane and I get a monthly subscription box called Loot Crate so we started looking around to see what else is available. 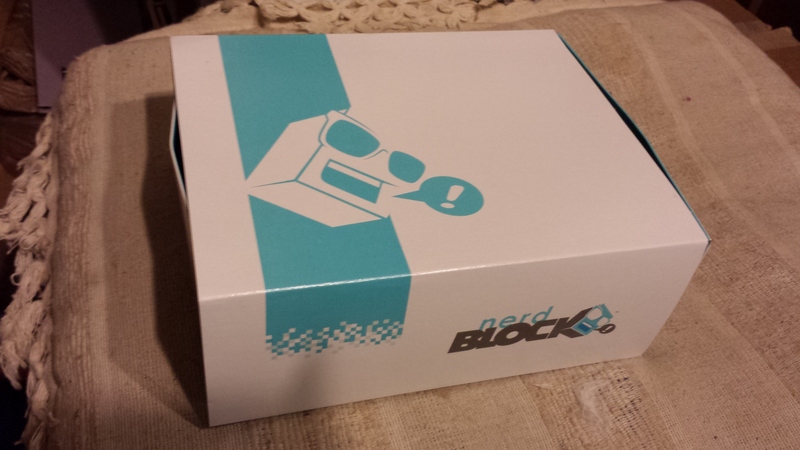 We found another company based out of Canada called The Nerd Block. 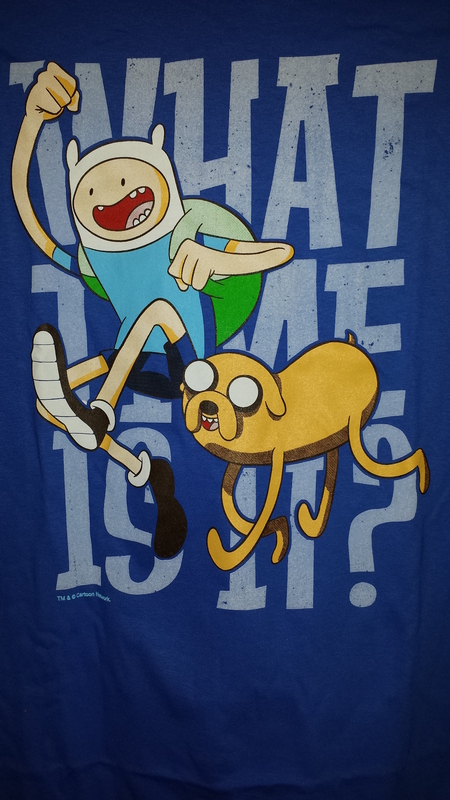 I was initially very excited because the month I chose to try out the Nerd Block had Adventure Time merch included. 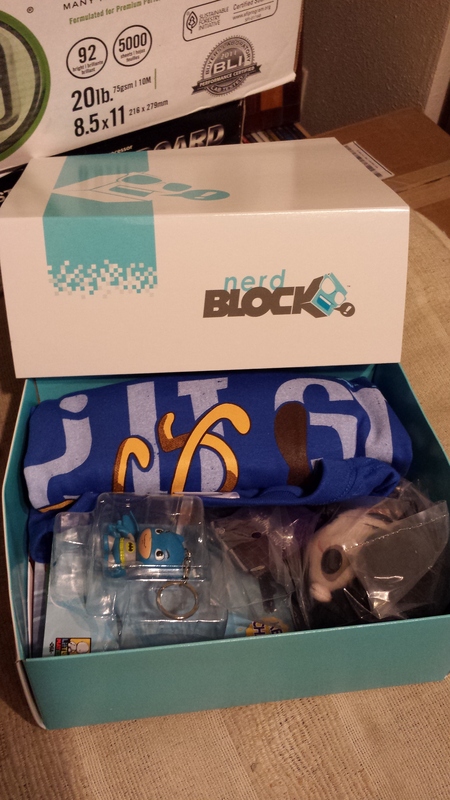 Nerd Block has corporate partners including Star Wars, Marvel, DC, Nintendo and Adventure Time. Not sure how this partnership works on their end though. The subscription is $19.99 a month plus shipping. Every month includes a t-shirt. If you need a plus size T-Shirt they charge extra. With everything together, I wound up paying $31.00 US. The shipping took longer than I expected. To the US it’s usually 4-6 days but mine took more like 10-14 days. They also ruined the surprise by having to post the contents on the outside of the package. 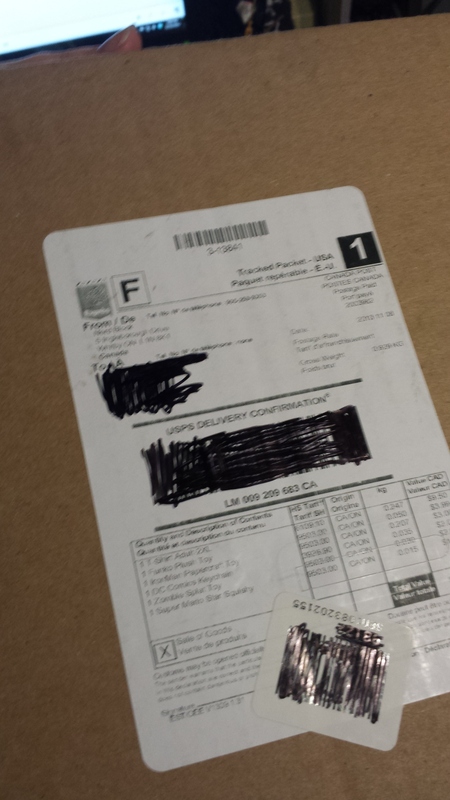 There was a huge customs label that said exactly what was included in the package. 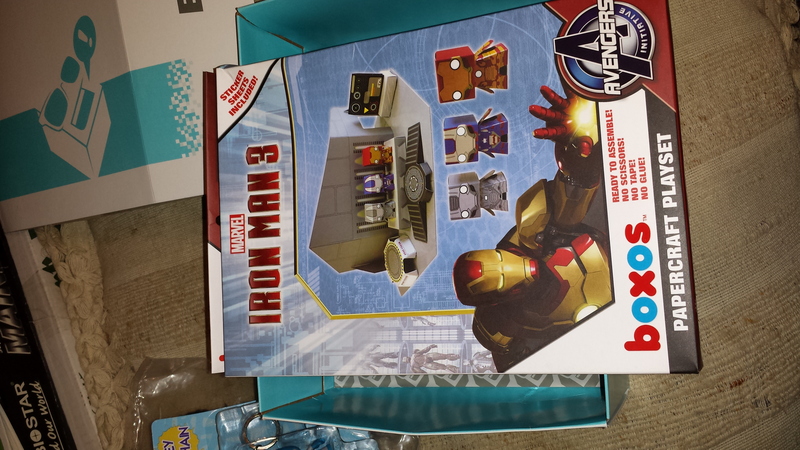 The packaging was pretty spiffy though. They had the box inside a really sturdy brown cardboard box. It protected the actual box amazingly well, which was flimsy light weight card stock. 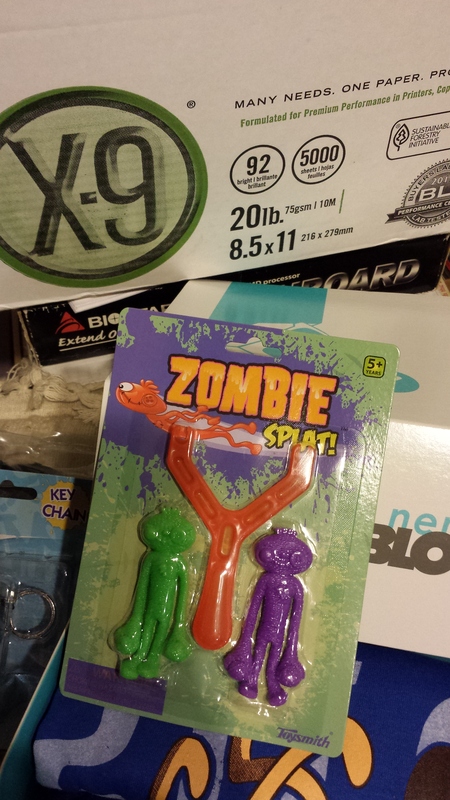 Once I opened the external packaging, I was eager to see what the described contents looked like. The T-Shirt was an Adventure Time shirt. 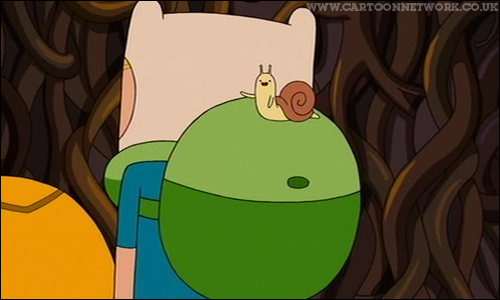 I love Adventure Time and Bravest Warriors, so this was a win. 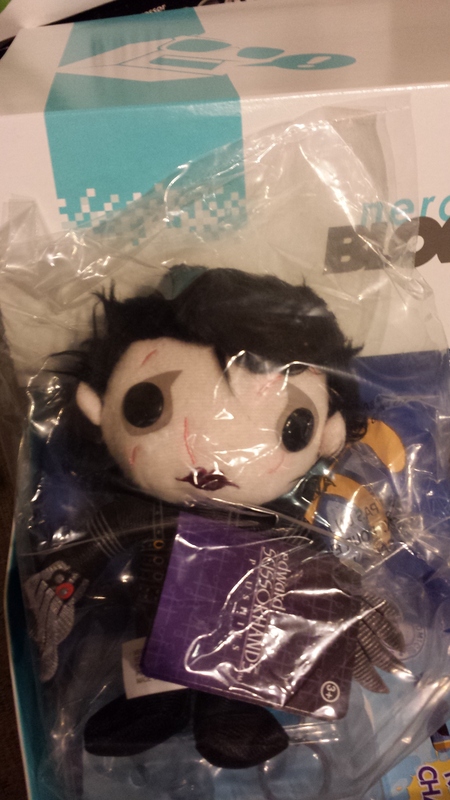 They included a Funco Edward Scissorhands plushy. I love him. I will whisper to him sweetly at night and let him know it’s ok. Just don’t cut me and everything will be alright. They also included Funco brand paper models. These were Iron Man models. I gave them to Kane. He loves paper minis. I think it’s rather humorous they include Funco since they are a local company. 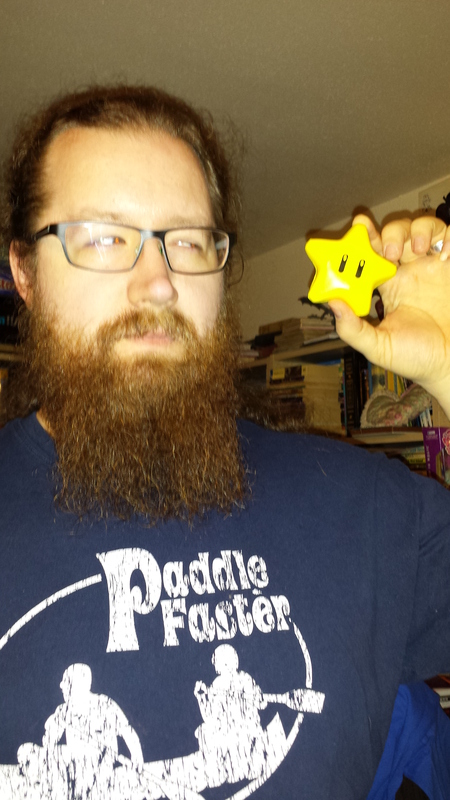 A Mario star was in the box. It turned out to be a squishy, foam, stress ball type thing. I actually like this little novelty more and more each day. I may have to bring it to work. 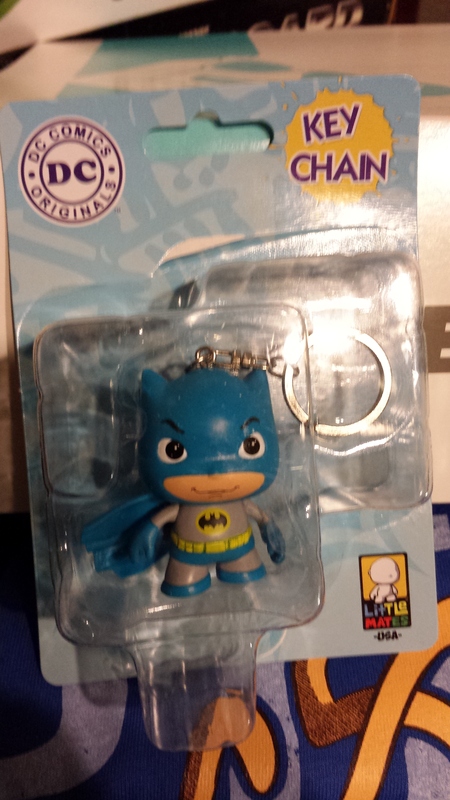 They also included a generic looking, chibi Batman key chain and some sticky wall crawler aliens. I expected a little more from my subscription box because I had paid so much. I realize that things are different in Canada, but I don’t feel like I really got my money’s worth from the box. Also, I can’t explain it really but it didn’t have much soul to it. They felt like things in a box. I didn’t get super excited about anything they had included. Looking at other people’s reviews of the Nerd Block, they don’t really change much from Month to month. There is always a T-Shirt which is cool but then they throw in some figures. Bam… that’s what they do. The internet had lots of reviews of the box, but I don’t really see a community either. If you can point me to one, please let me know. Just a little disappointed. It’s a decent product though. My cats liked it though. 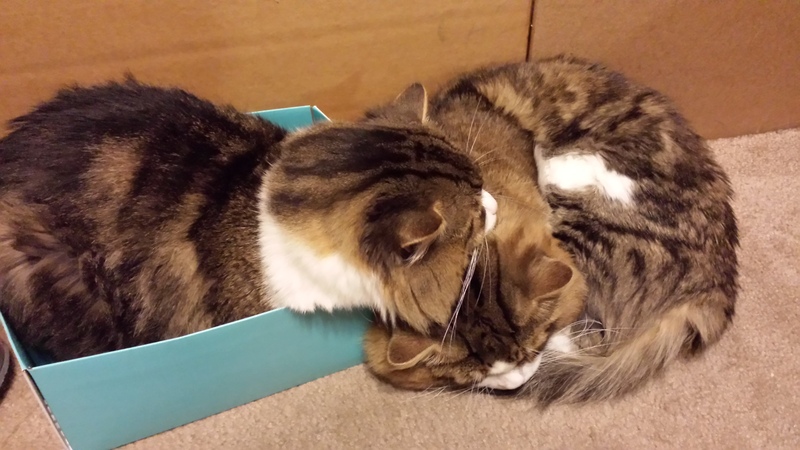 They’ve claimed the box in the name of catdom!